Art Alternatives Super Value Canvas Panel packs are the ideal painting surface for artists that use lighter paint applications, artists looking to practice techniques, for creating large quantities of work, for classroom projects or artwork on the go. Unbleached 3 oz cotton is primed with acid-free acrylic titanium gesso, for a finished weight of 8 ounces. Wrapped around an acid-free recycled paper board core. Suitable for all acrylic paints, oil paints, and other wet or dry media. 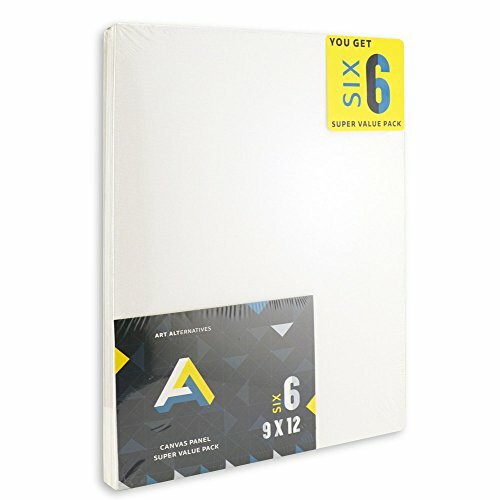 Panels measure 9 x 12 inches and come in a pack of 6. View More In Boards & Canvas.